I paused, the feverish clicking of keys coming to a halt. I listened closely, almost in disbelief. It was the second morning I heard its song; a lonely bird chirping outside the window. Only a few chirps and it was gone. I waited for more but was satisfied to have gotten even a prelude. We’re still in the dead of January and yet its spring song made my heart flutter. Winter is long where I live. Not as long as in other parts of the country but too long for my liking. Everything is grey, silent and rather sleepy. It’s not a bad thing per se but I find myself yearning for more light and warmth. But I know my wanting and the reality of winter are two very different things. As we’re on the cusp of temperatures in the single digits and perhaps even as low as 0 Fahrenheit, I can’t help but want to curl up in a blanket and hibernate for the remainder of this season. But as that’s neither feasible or physically possible, I’ll do the next best thing, which is cook comfort food - in the form of curry. Warming, satisfying, hearty curry. This curry is one I’ve taken through more testing than perhaps any other recipe. I wanted to get it just right. I was hung up on the textures and consistency of the sauce (because after all, it’s the sauce that’s everything). I would like to say that I hoped for it to taste as authentic as possible - whatever that may mean. Chicken Tikka Masala is a surprisingly easy recipe to make, filled with loads of spices and flavors, with Garam Masala being the star of them all. 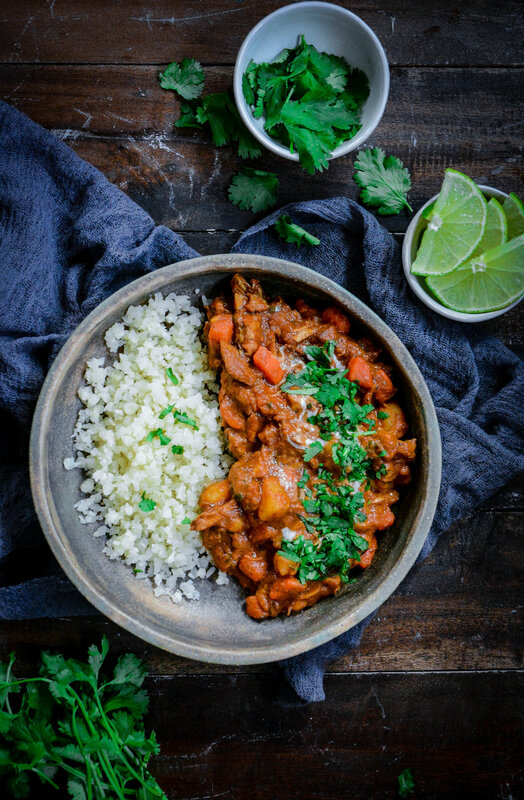 I put a little spin on this curry by making it even heartier and adding carrots and potatoes. You can eat it on its own, serve it with rice or cauliflower rice. In small mixing bowl, mix all spices under marinade. Reserve half and add half to ziplock bag or container. Add olive oil and mix well. Add chicken and let marinate for at least 1 hour or up to 12 in the refrigerator. Heat dutch oven over medium high heat. Add oil or ghee and chicken and brown chicken for 5 minutes on each side. Set aside on plate. In same pan, add onion and salt, and cook for 8 minutes until translucent. Next add garlic, ginger, reserved spice mixture, garam masala, pepper, paprika and cook for 30 seconds. Add in coconut milk, tomato puree, tomato sauce, coconut sugar, chicken and let simmer on low heat for 40 minutes with lid on. Stir occasionally. Meanwhile, add cut potato and carrot to soup bowl and cover with enough water to submerge. Bring to a boil and cook for about 8-10 minutes until vegetables are tender but still have a bite. Drain and set aside. When sauce has thickened and chicken is cooked through, add cilantro, squeeze of lime vegetables and simmer for another 5 minutes. 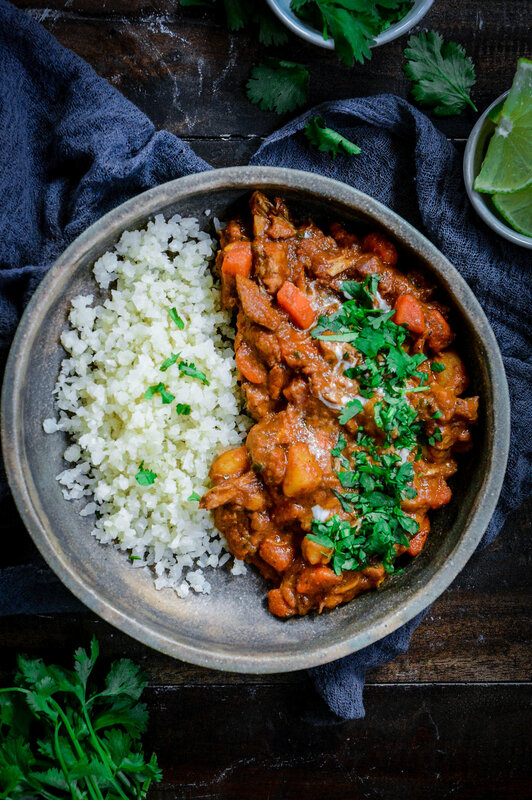 Serve over rice or cauliflower rice with additional cilantro if desired.